NISHI TECHNO-SYS is Designer and Manufacturer of Industrial Conveyors from Mumbai. The Industrial Conveyors we make available are known for their high tensile strength and long functional life. To meet the bulk and urgent requirements of the buyers, we maintain a large stock of the Industrial Conveyors in our state-of-the-art warehouse. We also make available Belt Industrial Conveyors and Roller Industrial Conveyors. The entire range of the Industrial Conveyors is reasonably priced by us. Screw Conveyors made of SS304 / SS316 or M.S Contact Parts. most of this conveyor useful where total close material handling is require to reduce chances of contamination, this conveyor is having Blades ( Flights ) mounted on Hollow pipe shaft and shaft is connected to direct Gear Motor or with sprockets, Fights are totally covers with shell made of circular or Trough type This conveyor is suitable for speed 100 kgs/hr to 5000 kgs/hr. 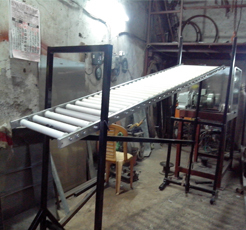 This Chain Link Conveyor also can be used when some food items fry in deep oil. In Automobile industry it can be use to handle hot parts from one machine to another. This conveyor similar to belt conveyor instead of Belt here we are using chain link made belt, these chain links made of SS304 / SS202 and MS This is most useful in where Hot material need to convey from one point of another point. We are also providing heating arrangement on top of conveyor belt. Biscuts Industry, Wafers, Potato chips Industry use these kind of chain links. This conveyors are available in Stainless Steel / M.S.with Powder Coated or Sleeves coated. These are useful in Packing Line for Box Packing / Loading of Heavy Materials in to Trucks / Internal Moments of Heavy Bags or Machined Job in Auto Mobile industry. Useful for conveying Powder, stones, fertilizers, Granules, Minerals, belt conveyor available in Flat Belt Conveyor, Inclined Belt Conveyor, Inspection Belt Conveyor Belt Conveyors are used in Packing Department, Soap pellet feeding, Powder feeding in Hopper /reactor vessels Loading – Unloading material from Godown / Truck . It is also most commonly used in Ceramic / Cement Industry. Belt Conveyors are available in Natural / Synthetic Rubbers Belt in 3 ply to 6 ply depend upon applications suitable for capacity in Powder / Granules material around 200 kgs/hr to 20,000 kgs/hr. We manufacture equipment and systems for handling a wide range of dry bulk materials. Nishi Techno-Sys manufacturing pneumatic conveying of dry bulk solids for the process industries, like Powder Chemical, Sugar Powder, Silica, Ash, Coal powder, Bulk Drug, Maida, Rawa, Concessionary. For good performance Pneumatic Conveying system can be used for powder varies from 0.3 gms/cc to 0.9 gms/cc powder material from 100 mesh to 400 mesh. This Conveyor mostly useful in Pharmaceuticals and Oil / Refinery Industry for Filling, Labeling, Tagging, Printing & Packing lines, his conveyor is available in Link Slats chain Conveyors made of SS304 or M.S. 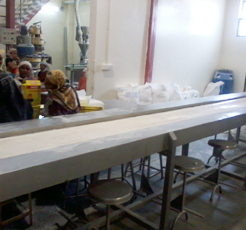 Conveyor is running at speed between 1 mtrs/ min. to 3 mts/min. In this Elevator Single strand chain are using with rough metal form buckets with guide track for chain, you can use this elevator up to 25 ft height at capacity 1 – 10 T/hr. 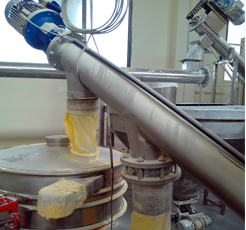 Mostly used in Oil Mill, Ceramic Industry, Food Industry, Mineral Industry and Bulk drug handling. Bucket Elevator helps to convey material from ground level up to desire height in vertical position. Industries we serve : Abrasive Industry, Paper mill Industry, Sugar Mill Industry, Ceramic tiles manufacturer Industry, Metal Industry, Food Powder Industry, Milk powder Industry, Mineral processors Industry, glass industry, Dyes industry, Detergent manufacturer Industry, ash Industry, cashew Industry, Biscuits manufacturer Industry, Resins Industry, Chemical Industry Industry, Guar Gum Industry, Atta Industry, Masala Industry, Explosive Industry, Gelatin manufacturer Industry, Polymer Industry, Pharmaceutical Industry, Bulk Drug Industry etc.